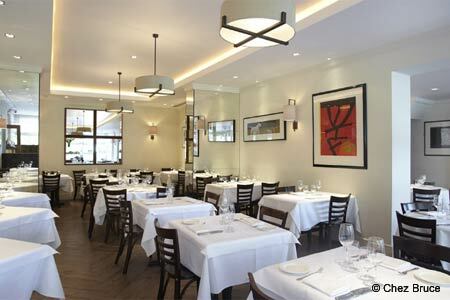 One of London’s best restaurants, offering French-inspired cooking in leafy Wandsworth. : This restaurant on the edge of Wandsworth Common changes little, but why should it when Chez Bruce enjoys such well-deserved success? Closely packed tables sit under a vaulted ceiling; the fixed-price menu ensures a full house. Service is relaxed and efficient, a fine backdrop to serious, French-inspired cooking that is long on robust flavors, short on hype and delivers with a punch. The menu changes day by day, and the inspiration is a mix of multi-layered European influences, exemplified in the likes of fresh tagliatelle with duck ragoût, chanterelles and Parmesan, or thin-sliced herb-crusted loin of pork with grilled fennel and simply dressed with lemon and olive oil. Mains might include seasonal game like grouse with game sausage, damsons, smoked bacon and spelta, or red mullet with grilled squid, sautéed black rice, fennel and rouille. The cheese board is first-rate, justifying the extra £5 charged. The wine list is a model of restraint and excess, but whichever end of the scale you wish to play, there is a tightly focused something-for-everyone approach. 3-course dinner £49.50.